EASY IMSTALLATION – Plug and play, computer light strip with flexible FPC substrate and magnet ,the led computer strips are firmly and easily attached to PC case ,only suitable for iron surface only. SUPER BRIGHTNESS – 5050 RGB color changeable LED computer decor Light is super brighter than the normal led strips to achieve best lighting effect for your PC computer. CONTROLLED VIA REMOTE CONTROL – 4 dynamic light and 16 static light colors change , flash-rate adjustment ,breathing effect can all be controlled by 24 Key RF Remote Controller. SAFE&LONG LIFESPAN – Life span is over 100,000+ hours. 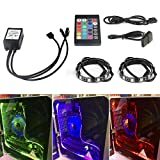 PACKAGE INCLUDED – 2pcs 12inches(30cm) magnet RGB LED computer light strips, remote controller, Molex 4-pin connector, and 20cm extension cable. 2.Connect the 4pin connector to PC power supply and other connect to the IR control box. 3.Peel off the paper and stick the adhesive tape back in a proper position in the PC case. 4.Connect 2 led strip lights to the 4-pin ends with the extension cable. 5.Attach the strips well on the metal surface of the PC computer case. 1. The led strips is for decoration only and not suitable for household illumination. 2.when the Magnet RGB LED computer Strip Light keep flashling and cannot be controlled by the computer, you may need to take the battery out and put it in to recheck 3.the output of power supply 12V and it is just ideal to run 30cm lamp strip at most.When the lamp strip after cutting ,the welding contacts cannot mixed as it may easily get the strip short circuit.